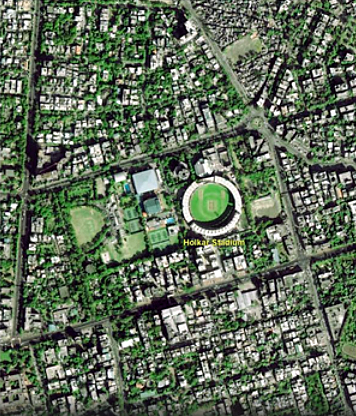 India's Cartosat-2 Series satellite was launched on board the PSLV-40 rocket from the Sriharikota spaceport on January 12 and the first day image has been by the satellite and shows a portion of the Indore city in Madhya Pradesh with the Holkar Cricket Stadium in the center of the image. The first image captured by the Cartosat-2 satellite. The image was acquired on January 15, three days after the launch of the satellite and was released on January 16 on the website of the Bengaluru-headquartered Indian Space Research Organisation (SRO). ISRO has said the satellite would be brought to its final operational configuration in the next few days, following which Cartosat-2 will start to provide high-resolution scene specific spot imageries using the onboard panchromatic (black and white) and multi-spectral (color) cameras. Cartosat-2 is an advanced remote sensing satellite similar in configuration to earlier six spacecraft in the series and intended to augment data services to the users. The images sent by the satellite will be useful for cartographic, urban and rural applications, coastal land use and regulation besides Geographical Information System applications, among others. Thirty other satellites, including 28 from foreign countries, were also successfully launched by PSLV C-40 on January 12.